Improve student enrollment outcomes and meet institutional goals through the effective management of student enrollments. Published with the American Association for Collegiate Registrars and Admissions Officers (AACRAO), the Handbook of Strategic Enrollment Management is the comprehensive text on the policies, strategies, practices that shape postsecondary enrollments. 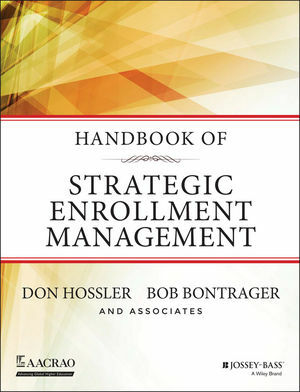 This volume combines relevant theories and research, with applied chapters on the management of offices such as admissions, financial aid, and the registrar to provide a comprehensive guide to the complex world of Strategic Enrollment Management (SEM). SEM focuses on achieving enrollment goals, and sustaining institutional revenue and serving the needs of students. It provides insights into the ways SEM is practiced across four-year institutions, community colleges, and professional schools. Strategic enrollment management has become one of the most important administrative areas in postsecondary education, and it is being adopted in countries around the globe. The Handbook of Strategic Enrollment Management is for anyone in enrollment management, admissions, financial aid, registration and records, orientation, marketing, and institutional research who wish to enhance the health and vitality of his or her institution. It is also an excellent text for graduate programs in higher education and student affairs. DON HOSSLER is a professor of educational leadership and policy studies at Indiana University at Bloomington. BOB BONTRAGER is senior director of Consulting and Strategic Enrollment Management Initiatives for the American Association of Collegiate Registrars and Admissions Officers (AACRAO).